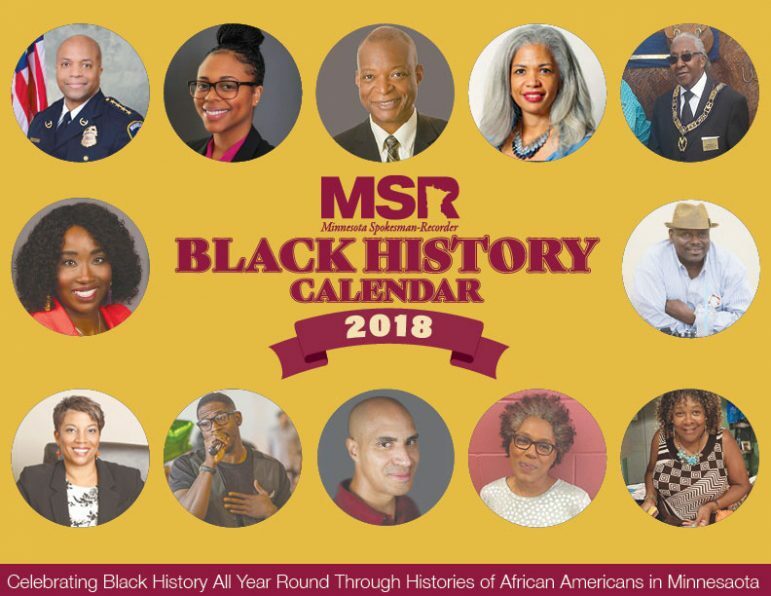 Order your 2018 MSR Black History Calendar today! Included in the calendar are feature profiles on local news-makers and businesses, as well as notable figures in Black history. A perfect gift for family and friends! Proudly display one of these historic keepsakes in YOUR home or office for just $15.00! Featured in this year’s calendar: Medaria Arradondo, Shakeyla Barber, Jacob Gayle, Dr. Tonya Jackman Hampton, Charles Snargrass, Sr., Dr. Sylvia Bartley, Walter “Q Bear” Banks, Chanda Smith Baker, Mike DeCole, Kobie Boykins, Timi Bliss and Rose McGee. Call 612-827-4021 today or send a check or money order to the address below with $15.00 (plus a $6.00 S&H fee).